Red Pepper can describe several varieties of peppers, though most often it is used to describe hot peppers used in Mexican or Asian cooking. It can also refer to a ripened variety of bell (green) peppers, often used to make roasted red peppers. Bell peppers, also known as sweet peppers, are like the Christmas ornaments of the vegetable world since they are beautifully shaped, glossy in appearance and come in a variety of vivid colors such as green, red, yellow, orange, purple, brown and black. Despite their varied palette, all are the same plant, known scientifically as Capsicum annuum, and are members of the nighstshade family, which also includes potatoes, tomatoes and eggplant. Beverage complements: Milk and other dairy products are known to cut the heat in the mouth if drunk while eating spicy dishes. Choosing: Choose peppers that have deep vivid colors, taut skin, and that are free of soft spots, blemishes and darkened areas. Their stems should be green and fresh looking. Peppers should be heavy for their size and firm enough so that they will gently yield to slight pressure. Avoid those that have signs of decay including injuries to the skin or water-soaked areas. The shape of the pepper does not generally affect the quality, although it may result in excessive waste or not be suitable to certain recipe preparations. Peppers are available throughout the year but are usually in greater abundance during the summer months. Buying: You can buy Red Pepper to any local and supermarkets. Procuring: Peppers are easy to grow. They like hot dry weather. 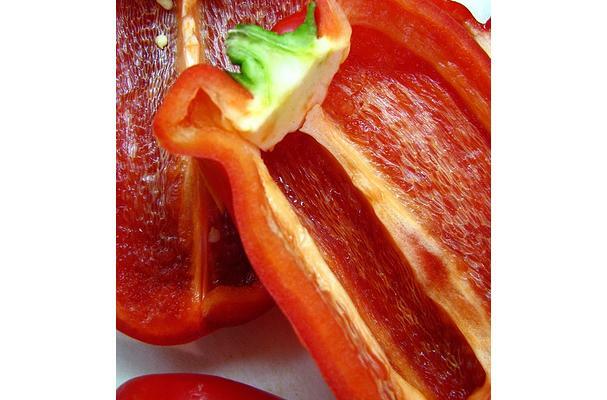 Most of the heat in red peppers is found in the seeds and white ribs around them. To decrease the heat in fresh peppers while still retaining the flavor, only use the red meat of the pepper and discard the rest. Cleaning: Before coring and/or cutting the pepper, wash it under running water. If the pepper has been waxed, you should also scrub it well. Many red peppers can be found in the spice section of the grocery store, dried and ground, such as cayenne, chili powder, red pepper flakes. Most peppers do very well being dried whole. History: Chili peppers have been a part of the human diet in the Americas since at least 7500 BC. There is archaeological evidence at sites located in southwestern Ecuador that chili peppers were domesticated more than 6000 years ago, and is one of the first cultivated crops in the Americas that is self-pollinating. Chili peppers were domesticated at least in different parts of South and Central America. Christopher Columbus was one of the first Europeans to encounter them (in the Caribbean), and called them "peppers" because of their similarity in taste with the Old World black peppers of the Piper genus. when I was 8 years old I was in a kids fashion show.. they asked each girl at the end of the runway what her favorite food was. Everyone said, cakes, cookies and ice cream... my answer was red bell peppers! A foodie from a young age!